AI and data-led are the technologies guiding the technology industry’s vision. The AI market will grow to a $190 billion industry by 2025, according to research firm Markets and Markets. Yet when it comes to embracing the exciting opportunities that AI promises, further emphasis needs to be placed on the analytics foundation of an enterprise. Why? Companies need to ensure that they are responsibly prepared with a data literate cohort of employees and an established analytics community before they can feed the AI data, and trust in the results it supplies. Gartner predicts that through 2022, 85 per cent of AI projects will deliver erroneous outcomes. The analyst considers that this will be due to bias in the data, the algorithms, or the teams responsible for managing them. Without understanding the potential complexities AI can bring as a result of poor input and management we, as a society, cannot hope to successfully implement this technology to improve our economy or way of life. And yet the allure of the AI-future remains both strong and a worthy goal, despite the risks and long development before AI can become a ubiquitous business tool. So, for those on this exciting journey looking to harness data resources and bridle AI, here are some signposts to point the way ahead. They form a three-part checklist for ensuring you build a strong analytics roadmap for AI that scales: Evaluate your present analytic situation; rethink your analytic strategy; and liberate your analytic talent. You may have analytics skills and solutions tied in a hybrid of in-house and external sources: Using consultants and data sources from outside. It’s important to be able to understand within the current analytics foundation, and to plan for future AI deployment, how decision making and analytic workflows are reached. Without understanding the process it’s hard to say if the service is efficient and well governed. AI needs data like a fish needs water. Data is what allows AI to ‘swim’. Any organisation with AI ambitions needs to have a solid analytic foundation. That means storing, cleaning, categorising, trusting, governing, and effectively managing a large amount of data. This is an inherently collaborative effort. It might be that these skills lie in outside sources, but ideally for an agile enterprise a skill base can and should be built up by the employees who understand, use, and generate their own data. That way they will ensure the integrity of what AI will use and are the natural experts to understand if AI is giving sensible outputs, and then to apply these outputs into their job of making things happen in the human space. It’s wise to seek areas where even if gains are small, they are easier to achieve. Aiming high is admirable, but by setting a goal like benchmarking or better monitoring – rather than creating outcomes – means that failure isn’t costly and learning opportunities can be applied to bigger and bolder projects once the tools and tactics of the DevOps and data teams are proven. 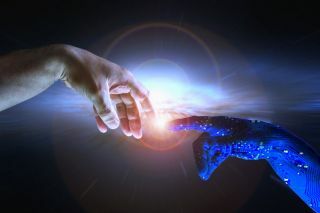 If you prove the concept and get AI solutions into the organisation, you can then look to make it serve your line of business employees and free up their time to work on more complex areas of the business, or those requiring the empathetic or creative touch. AI can be exciting when it replaces tedious elements of the role. If they can use it to shine in other areas it’s an aid to them – not a replacement. A multidisciplinary team involving data scientists, AI developers, and line of business employees could prove to be a pragmatic approach to manage the whole strategy and implementation: Data collection, mining activities, machine learning, and the automation of the workflow. Ensure that the humans are front and centre of the analytics process. It might be very tempting from a top-down perspective to plan to replace elements of employees’ roles with quicker AI processes. The trouble is that humans do a lot more than process data and make rules-based decisions. They make lateral connections, ascribe feelings and motives, and troubleshoot better than any ‘general AI’ will be able to for years, if not decades. The humans of analytics bring more to the table than their ability to make and follow procedure: They bring experience and empathy. And since we operate in a world of humans, built for humans, by humans, and presumably for the benefit of humans, it’s best to keep a few of them around to keep the humanity and flexibility that an effective (as well as efficient) system needs. But don’t forget: Castles built on sand don’t last. Build up your analytic talent, ensure they understand their data sources, procedures, and outputs, and they’ll be the ones to champion a rock-solid AI programme.